Everything is connected and we exist in more than one plane, this is the concept of the singularity and multiverse. We are tuned in to one plane but it doesn’t mean that’s the only one that exists. 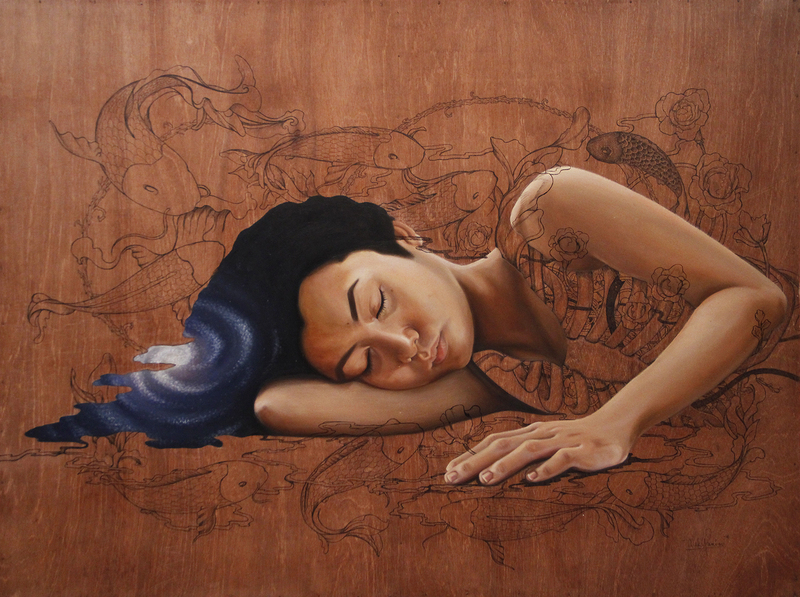 With this painting, I portray this concept with a young girl sleeping. As she sleeps, she’s creating a new universe with other elements, including her’s, moving in accordance and harmoniously in different planes. I depict these elements with flowing drawings of nature and predominantly koi fish. In Japanese culture, koi fish are recognized for their beauty and their ability to transform the observer into otherworldly states of perception. In Chinese culture, 9 koi fishes symbolize success and abundance with one black koi that neutralizes the bad luck. I entitled it Biophilia influenced by the music by Björk and the hypothesis of human beings having an instinctive bond with other living systems.